This is a guest post from Checkmate, a provider of SMS communication tools for hotels. Mobile messaging has changed the way that people communicate. Every day, new articles and studies are released showing that consumers now prefer text-messages to phone calls. This shift is especially relevant to hotels and other service businesses, where nearly 80% of consumers favor businesses that offer text message capabilities and 86% of customers will pay more for better customer experiences. What types of messages should we send? What tone should we use when texting with guests? What instructions should we provide to our teams? 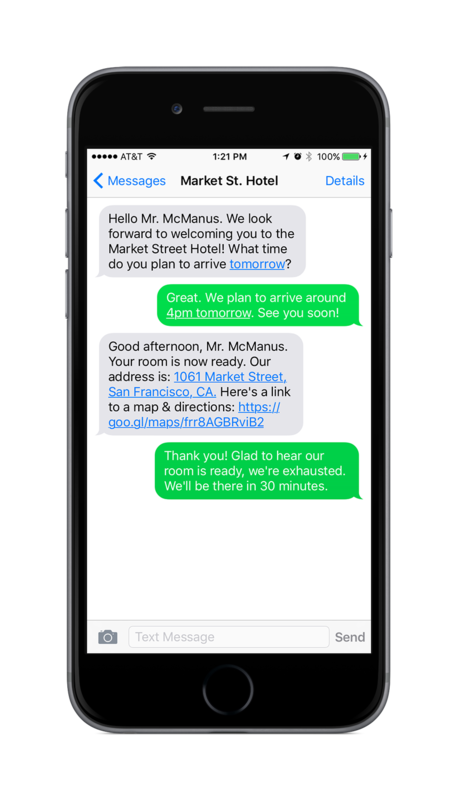 Through our work with hundreds of hotels, Checkmate’s Customer Success team has compiled a list of best practices for hotels to interact with their guests through text-messaging. Your guests’ text message inboxes are sacred! This is where they have intimate conversations with their friends, their families and colleagues. Your text messages should always feel like they’re coming from a person and provide guests with comfort in knowing they can easily reach you when issues arise. Your messaging should be an extension of your brand and the personal, hands-on service that you already provide. Some simple ways to make your service even more memorable: Include a personal sign-off on messages (ex. “Cheers, Mallory”), reference and recall past customer experiences, and use emojis! Texting is the perfect way to ask a quick question or resolve an issue, but it’s not be the best medium to have complex conversations or send paragraphs of information. Keep your customer messages short, sweet and to-the-point. Use conversational verbiage such as contractions and abbreviations where appropriate, and break up content into a few short texts. Finally, know when to pick up the phone or switch to email. In some cases, a 5-minute call or long-email is easier than an extended back and forth. Giving your customers an easy way to reach you generates more happy customers. While customers don’t expect immediate responses to a text-message, hotels should aim to respond to new messages within 15 minutes. We suggest assigning shift-specific responsibility for responding to customers, so you know who is responsible at different points throughout the day, and communicating business hours so customers know when you’re available (or more importantly, when you’re not). Texting is a super personal experience for you and for your guests. Unlike mass marketing channels (email marketing, robo calls, etc. ), when you text your guests you have a real chance of building a lasting one-to-one relationship. While it’s okay to promote a personalized service to your customers, your customers should want to receive the messages you're sending. We know it’s tempting to blast out the latest promotion or sale, but it’s more important to respect your guests’ desires. Texting is great way to receive feedback from guests. Don’t play the guessing game when it comes to customer satisfaction, or even worse - find out on Yelp or TripAdvisor when someone had a bad experience. Send messages to ask customers about their experiences and respond to both the positive and negative. Fix service issues right away and encourage guests who respond positively to leave a great review when they depart. What impact has text-messaging had on your guest relationships? Have you identified other tips and tricks to share with fellow hoteliers? If so, let us know in the comments below! Checkmate’s communications and guest management platform helps hotels build customer relationships in today’s communication channels. Checkmate creates a single profile and conversation thread for each guest over time and across channels – SMS, email, and in-person. A shared inbox for all employees facilitates team collaboration and ensures staff are aware of all customer interaction. As a result, hotels can better delight guests, prevent service shortfalls from turning into negative reviews, and strengthen their operations. To learn more about how Checkmate works with Frontdesk Anywhere: Request a Demo or Send us a Text.